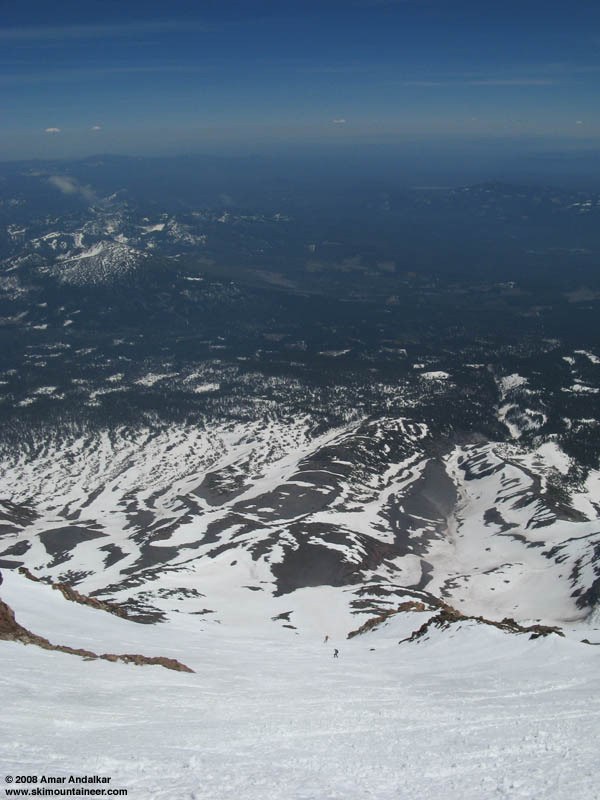 Summary: An unexpectedly amazing day on Mount Shasta, completing a summit traverse by ascending Avalanche Gulch on the southwest side and skiing down the magnificent Hotlum-Wintun route on the east side, in excellent snow conditions including some nice corn. An ascent of 7200 ft followed by a descent of 8900 ft, with about 8700 vertical on skis. The summit was sunny and warm, with nearly calm winds, just beautiful. Snow coverage on the east side is much better than any other side of Shasta right now. 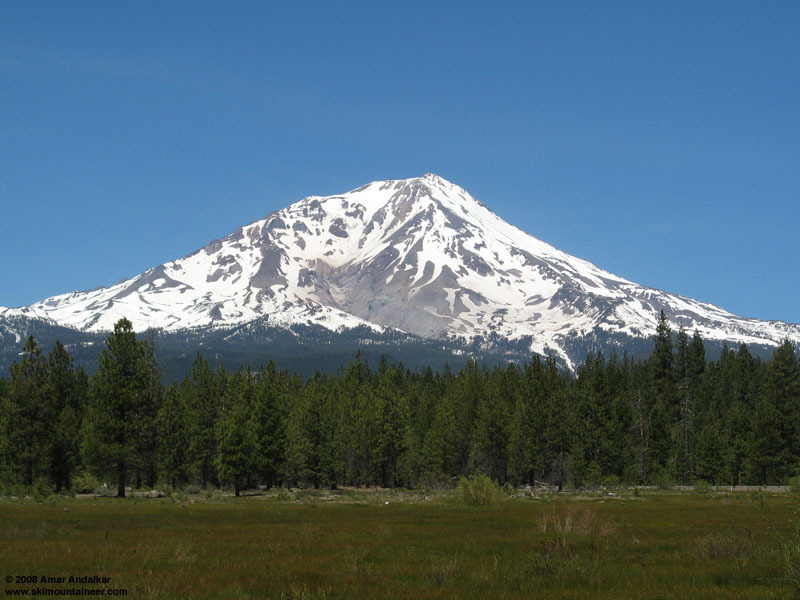 Details: After my morning ski run on Lassen Peak on Friday (see other TR), I spent the day relaxing and then driving back north to Mount Shasta. 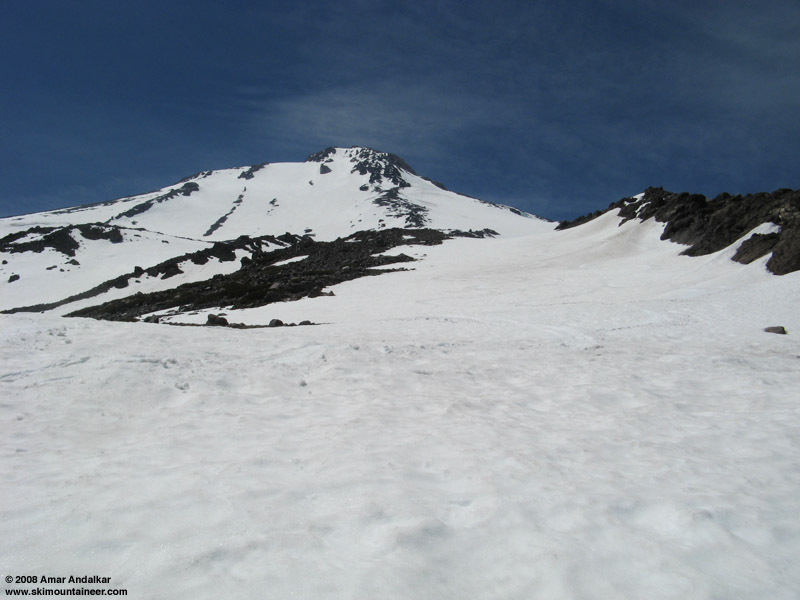 I had skied Shasta's West Face on Wednesday after climbing up Avalanche Gulch (see other TR), but this time I was hoping to easily summit, as the high winds of Wednesday had since died down to nearly calm, and then ski down something else. I car camped at Bunny Flat, woke up at 5am and skinned uphill at 6, trying to summit by noon. I was hoping that I would meet someone on the summit who had ascended the Clear Creek side (that road is blocked by snow, 3.5 miles from the TH), ask them if they'd be willing to give me a ride back around the mountain, and then ski down that way. The default plan was just to ski the West Face again. Snow conditions in Avalanche Gulch near 9500 ft. Lovely. The overnight low was only 46 F at 6950 ft Bunny Flat, and the heavily-runneled snow was soft enough for easy skinning. I used ski crampons, but they were only necessary above 9000 ft where the snow had frozen hard overnight. Skinned up to Helen Lake at 10440 ft just after 8am, where I caught up to the first of many groups of climbers. Took a half hour break to eat and change over, putting the skis on the pack and cramponing up the rest of the way on foot. Went the same route as Wednesday, right of the Heart and through the nice chimney in Red Banks. Strangely enough, many climbers were ascending left of the Heart this day, exposing themselves unnecessarily to much more rockfall hazard and taking a longer route to the summit, too. Seemed like stupid behavior, probably one early group went that way not knowing the correct/safer route right now, and others blindly followed. Looking up through the Red Banks chimney, full of climbers. Unlike Wednesday when I climbed it in softened conditions at 2pm, the Red Banks chimney was frozen hard at 10am this day, and unfortunately a traffic jam of about a dozen ascending and descending climbers occurred just as I arrived. Many of the climbers were clearly ill-at-ease on the frozen 40-45 degree steep snow, one guy didn't even have full crampons on, just some mini instep type, and he looked petrified while descending. I managed to work my way through the mess quickly and safely, and then had an easy jaunt up Misery Hill and across the summit plateau. Only a light breeze at most, 5-10 mph, and calm most of the time. Lots of climbers up here, several dozen, but no skiers (several with AT ski boots, but no skis) and only a few snowboarders. Snow is nearly continuous along the traverse from the top of Misery Hill, but with several short bare sections now and melting fast. Reached the summit at 11:45am, in glorious sunny warm weather. Air temp was about 39 F, but it felt like 50-60 F on the warm summit rocks. Wouldn't be surprised if over 100 people summited on this Saturday. in the distance (center) and my pack and skis at lower left. on the upper Wintun Glacier, with the Clear Creek route below. Spent an hour up there on the summit, and asked anyone arriving up top if they'd come from Clear Creek. No luck. But then finally a pair of skiers showed up, they had climbed up from Brewer Creek (even longer access than Clear Creek right now) via the Hotlum-Wintun. They had parked 8 miles back from the TH where the road was blocked by snow, at 5300 ft, and had left their cars at 3am and skinned/climbed the whole 8900 vert in 9.5 hrs, including a long bushwhack through the woods at the start via GPS. Colin (from San Francisco) and Tucker (from Reno) agreed to let me join them, and we had an excellent ski descent down my favorite route on Shasta, maybe my favorite anywhere. Nice corn in many spots, over-softened in others (probably 10-11am would have been perfect for this east-facing route), but still better snow quality than the West Face. Snow coverage is MUCH better on the east side than the west, or any other side of the mountain. Colin and Tucker carving turns down the upper Wintun Glacier. Looking back up the Wintun Glacier. The snow was smooth and untracked below the uppermost slope, where it looked like others the past few days had been skiing a short way down and then re-climbing, since the roughened snow ended about 500 ft down. We had to cross a couple short sections of bare ground near 10000 ft, but otherwise the snow was continuous down to below 6000 ft, especially following a few nice gullies. Ski tracks near 10000 ft along Hotlum-Wintun Ridge, with the upper Wintun Glacier beyond. Zoomed view of the upper Wintun Glacier. We skied down to 6500 ft in about an hour, where the forest thickens, and then eventually spent another hour retracing the last 3-4 miles to the cars using GPS, crossing several clearcuts and logging roads, skiing across numerous short bare sections in the sunniest areas, and taking our skis off for a few longer ones. Very dirty snow as expected in the woods and mostly only 0-2 ft deep below 6000 ft, so this may melt out very rapidly. Just for fun, we skied the last snow-covered 1/4 mile of road back to the cars. We got about 8700 vert of skiing, as a rough guess. Not a bad showing for such a poor snow year on the upper mountain of Shasta. Skiing across a clearcut on the way back to the cars. Tucker was headed back to Reno, but Colin was going to SF and so he gave me a ride back to Shasta City since he had to get to I-5 anyway. But he didn't have time to drive me the 11 extra miles to Bunny Flat and my car, so I spent half an hour on the side of the road, trying to hitch a ride in 94 F heat at 4pm in my ski boots (and I had to stand on the sunny side of the road). Finally, I walked back 1/2 mile to The Fifth Season (the mountaineering store in town) and begged a ride from one of their employees, for $20. Well worth it. All in all, it was a somewhat long, fairly tiring, and very sweaty day with an unexpected reward that was so completely worth the extra hassle. One of my all-time best days on Mount Shasta! What a sweet trip; Hotlum Bollum had gigantic suncups on it for my ski--I can imagine what a great run you had from the looks of the snow..That $20 also came in handy for me when I ascended standard s. side route on Mt. Hood and then skied Cooper Spur route. The couple on the trail had never been to Timberline Lodge so with a 20 dollar bribe they got some extra site seeing in and I was back at the car by 1 pm. way to rip it up Amar, you got quite a nice streak going. looks like conditions are deteriorating quickly down there.